Is The Amount of Energy Put Into Mining, Processing, and Shipping Uranium, Plant Construction, Operation, and Decommissioning GREATER than the Energy a Nuclear Plant Can Produce In Its Lifetime? [Preface from Washington’s Blog: As we’ve previously documented, virtually all of the nuclear reactors in the U.S. are of the same archaic design as those at Fukushima. This design was not chosen for safety reasons. Rather, it was chosen because it worked in Navy submarines, and produced plutonium for use in nuclear weapons. New US plant designs are very near being licensed by the Nuclear Regulatory Commission without any Fukushima modifications. Indeed, given that Obama’s top adviser and top funders are connected with the nuclear power industry, they are being pushed through as quickly as possible. And – believe it or not – the same folks who built and run Fukushima will build and operate the new U.S. facilities. [Because climate is beyond the scope of what I want to focus on in Swanson’s post, I will not comment on this paragraph, other than to say that it will impress those who believe that man-made global warming is a real threat, and won’t impress those who don’t.] Nuclear energy is not an alternative to energies that increase global warming, because nuclear increases global warming. When high-grade uranium runs out, nuclear will be worse for CO2 emissions than burning fossil fuels. And as global warming advances, nuclear becomes even less efficient as reactors must shut down to avoid overheating. Economists and physicists call this quantity the “energy return on investment” or E.R.O.I. For a modern coal mine, for instance, we divide the useful energy in the coal that the mine produces by the total of all the energy needed to dig the coal from the ground and prepare it for burning – including the energy in the diesel fuel that powers the jackhammers, shovels and off-road dump trucks, the energy in the electricity that runs the machines that crush and sort the coal, as well as all the energy needed to build and maintain these machines. As the average E.R.O.I. of an economy’s energy sources drops toward 1 to 1, an ever-larger fraction of the economy’s wealth must go to finding and producing energy. This means less wealth is left over for everything else that needs to be done, from building houses to moving around information to educating children. “Balloon graph” representing quality (y graph) and quantity (x graph) of the United States economy for various fuels at various times. Arrows connect fuels from various times (i.e. domestic oil in 1930, 1970, 2005), and the size of the “balloon” represents part of the uncertainty associated with EROI estimates. The EROI for wind turbines compares favorably with other power generation systems (Figure 3). Baseload coal-fired power generation has an EROI between 5 and 10:1. Nuclear power is probably no greater than 5:1, although there is considerable debate regarding how to calculate its EROI. The EROI for hydropower probably exceed 10, but in most places in the world the most favorable sites have been developed. Figure 3: EROI of various electric power generators. So what does this mean? 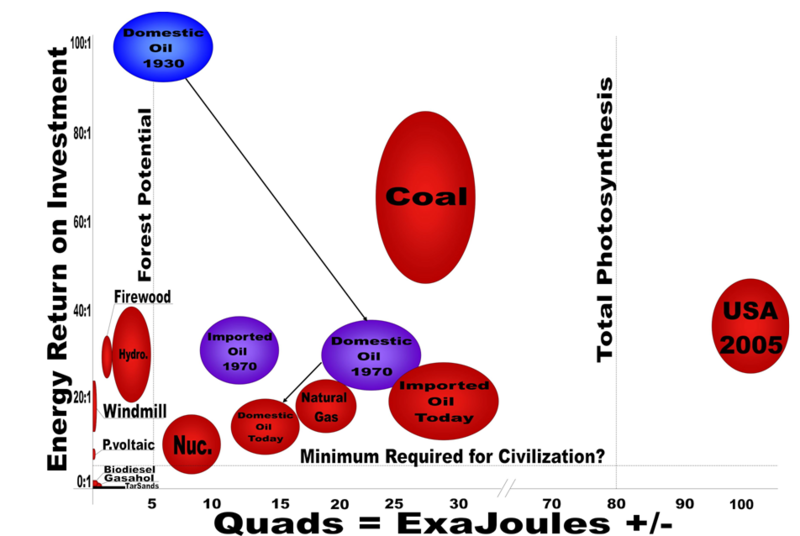 Comparing Professor Hall’s two graphs, we can see that virtually all forms of alternative energy – wind, geothermal, photovoltaic, and hydro – have greater or equal EROI than fossil fuels and nuclear. Passive solar might be lower, unless it is incorporated into original building construction. However, Professor Hall’s figures were generated in 2006. All forms of alternative energy have become more efficient since 2006. We have found the information about the EROI of nuclear power to be mostly as disparate, widespread, idiosyncratic, prejudiced and poorly documented as information about the nuclear power industry itself. Much, perhaps most, of the information that is available seems to have been prepared by someone who has made up his or her mind one-way or another (i.e. a large or trivial supplier of net energy) before the analysis is given. As is usually the case, the largest issue is often what the appropriate boundaries of analysis should be. The following diagram, which should be considered conceptually if not necessarily quantitatively appropriate, illustrates the main issues. The diagram indicates from left to right the timeline of a power plant, with the initial negative values (“phase 1”) indicating the initial energy costs of plant construction, the large positive value generated over the reactor’s lifetime (with a correction for the energy to get/refine the fuel) and phase 3 indicating the energy required for dismantling the plant and sequestering the dangerous by products. Figure 8 – Lifecycle view of energy costs and production (Leeuwen 2005). 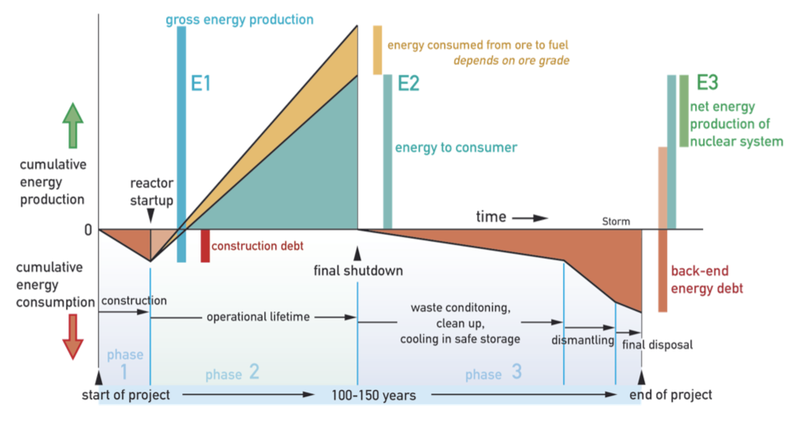 The above figure is a general outline of the energy costs and gains lifecycle, but does not accurately reflect the operational lifetime (which is more likely to be around 50 years) or the EROI (which depends on the study looked at). Click to Enlarge.The seemingly most reliable information on EROI is quite old and is summarized in chapter 12 of Hall et al. (1986). Newer information tends to fall into the wildly optimistic camp (high EROI, e.g. 10:1 or more, sometimes wildly more) or the extremely pessimistic (low or even negative EROI) camp (Tyner et al. 1998, Tyner 2002, Fleay 2006 and Caldicamp 2006). In other words, the International Forum on Globalization’s claim that EROI for nuclear is less than 1:1 is – at least according to the mainstream view – on the pessimistic end of the scale. But after Fukushima, that may be appropriate. This entry was posted in Business / Economics, Energy / Environment, Politics / World News. Bookmark the permalink.